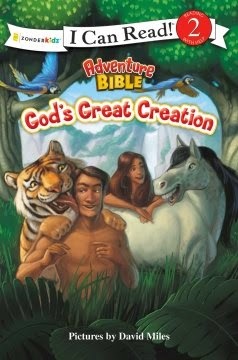 Adventure Bible: God's Great Creation is just an awesome book! My son is seven and this book is pretty easy for him to read! It flows really well, and covers Genesis and God creating Earth. It is a very bright and colorful book that keeps little ones interested in it! It is a Step 2 books, so this means it is for independent readers who have not yet progressed to chapter books. Even though my son can read chapter books, this book still held his interest. It was very age appropriate and teaches about how the world was created, but also how Adam and Eve were asked to leave Eden. This is not a watered down version of the bible, it is pretty straight to the point and just as the bible teaches in Genesis. My son really loved this book, and I love that this book is something he can read on his own and do his own bible studies! Es una linda historia, cuando mis hijos eran pequeños les gustaba leer ese relato en Genesis y quedan admirados de saber como fue la creacion del mundo. Interesante articulo!